If you are interested in agricultural related work then there are many ways to earn good amount of money with low cost. Amongst several work one of the best earning job is Rabbit Farming which is booming in recent days. Lot of farmers are earning good amount of money through this process. This farming heads to the production of wool (rabbit’s fur) and its meat for food purpose. Further explanation on how to earn money in this small scale industry will be explained. Investing approximately 4 to 4.5 lacs in this industry will earn you around 8 lacs annually. Paradise Rabbit Farm is located in Haryana and is one of the largest breeding sectors and generates high business through rabbit breeding. Mr. Rajesh Kumar, Director of Paradise Rabbit Farm said that the business of rabbit farming has been divided into various units. In each unit there is 7 female and 3 male rabbit. Paradise initially had 10 units. Setting business for these 10 units the farming cost will vary from 4 to 4.5 lacs rupees which is further divided into Tin shade cost between 1 to 1.5lacs, cage cost between 1 to 1.25lacs and food unit cost approximately 2lacs. Mr. Rajesh Kumar further explained that the breeding of male and female starts after 6months from their birth. The mother rabbit gives birth to around 6-7 babies. 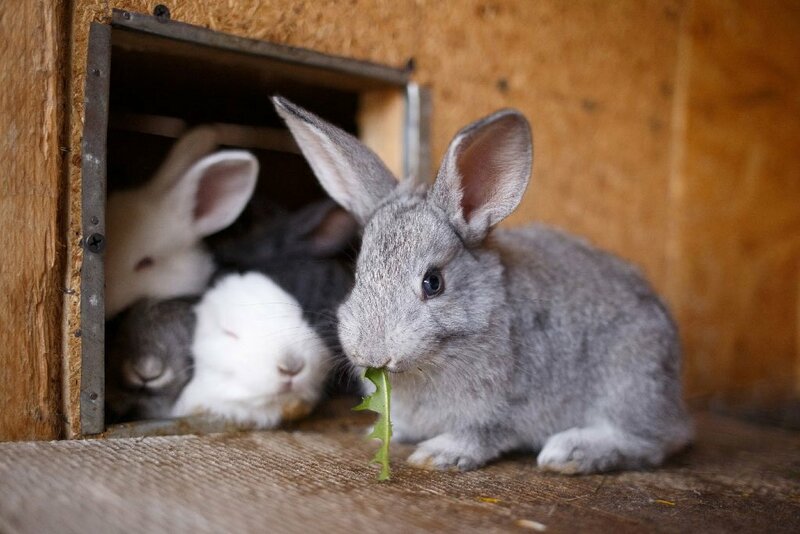 The pregnancy period of female rabbit is 30 days and by next 45 days the babies weigh around 2kgs after which they are sent to the market for selling. Mr. Kumar further added saying that per female rabbit gives birth to approximately 5 babies which means in 45 days 350 babies will be delivered. The rabbit unit is suitable for the baby to born and is not required to wait for 6 months to sell in market. Production farm (Paradise) also deal with selling and buying of rabbits. Director Rajesh Kumar said that 10 per units of rabbit matures within 45days and these are then sent to market for selling which costs around 2lacs rupees approximately. Then the buyer sells the rabbits for farm breeding, meat and wool business. He further said that one female rabbit is pregnant at least 7 times in a year. Keeping in mind the mortality of rabbit, sickness and any other health related disease it can be counted that in average of 5 pregnancy period rabbits of 10lacs rupees will be sold per year. Whereas if the food or forage for rabbit cost is between 2 to 3 lacs then rest 7 lacs will be pure extra income although in the initial beginning of the year, the investment would be of 4.5 lacs rupees but still 3 lacs is extra income. Director Rajesh Kumar said that he is now giving franchisee of his Paradise Rabbit farm. For setting up his franchisee business he selected few states like Uttar Pradesh, Haryana, Punjab, Himachal Pradesh, and Uttarakhand. However, interested person who wants to take up franchisee can contact him. This business provides guaranteed income. Through this process, complete training from rabbit breeding to marketing all will be taught as how to deal with it.